Curved geometry structures allow to cross large spans with little material, but their design is strongly dependent on manufacturing constraints. Covering them with flat panels and connections between beams are the main difficulties faced by designers today. This pavilion, designed as part of the intensive week Building Freeform at Ecole des Ponts ParisTech, meets these two requirements by proposing a new construction system : a reciprocal structure braced by flat panels. Reciprocal structures are self-supporting and greatly facilitate the assembly of connections. Curved geometry structures allow to cross large spans with little material, but their design is strongly dependent on manufacturing constraints. Covering them with flat panels and connections between beams are the main difficulties faced by designers today. 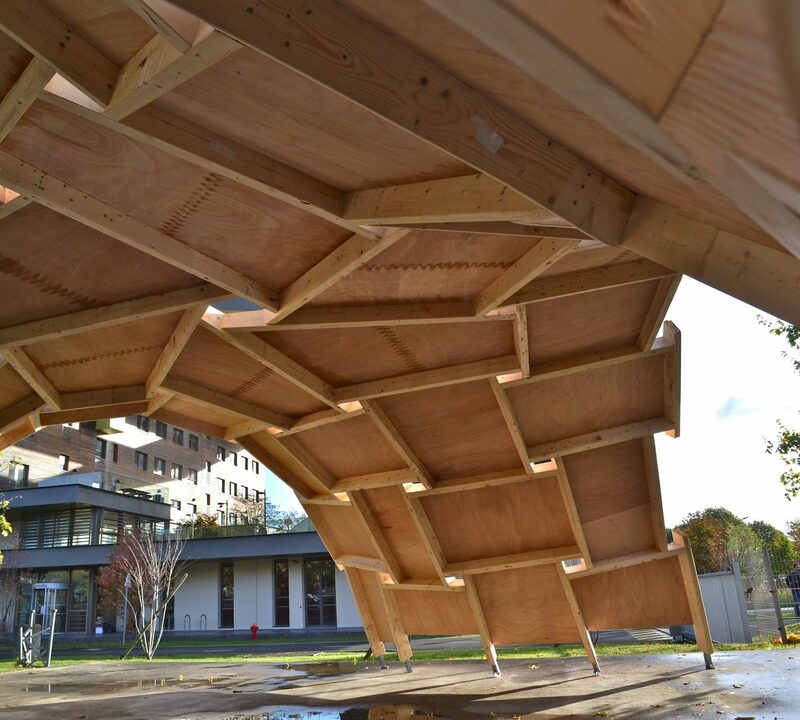 This pavilion, designed as part of the intensive week Building Freeform at Ecole des Ponts ParisTech, meets these two requirements by proposing a new construction system : a reciprocal structure braced by flat panels. Reciprocal structures are self-supporting and greatly facilitate the assembly of connections. A machining accuracy of less than one millimeter is required in order to assemble the different structural elements. Digital fabrication is necessary to achieve such tolerances on beams that are all unique pieces. The pavilion is the first to use the Build in platform of the Co-Innovation Lab des Ponts and its robotic manufacturing cell. STUDENTS: Beck Aurélien, Bellec Mathilde, Berrubé Alban, Borzone Mirko Antonio, Canela Gomà Ignacio, Chatelain-Lacam Louise, Corres Sojo Enrique, Dupont Maxime, Duval Laure, Figueras Cadenet Pau, Glevarec Quentin, Graillot Brieuc, Kamata Yukiho, Levionnois Anne, Maia Avelino Ricardo, Maitenaz Sébastien, Migliari Matteo, Montagne Nicolas, Ninino Bastian, Ortiz Hazarian Rafael Henrique, Pastor Moreno David, Pedrosa Torres Pedro Henrique, Pitance Jérôme, Ramos Musman Thiago, Souiki Amine, Tatarczak Agnieszka, Vaz Guilherme Frederico, Veres Lia Nóra, Vianna Da Costa e Faria Ana Clara, Zerhouni Sonia.